What Gets Made In LA Is Way More Than Movies The LA area is home to the most manufacturing jobs in the U.S., from clothes to metal parts to new aerospace tech. Companies have reinvented themselves, even as they struggle to find skilled workers. Los Angeles is a sprawling metropolis, and it was poised to become a manufacturing giant because of its unique geography. 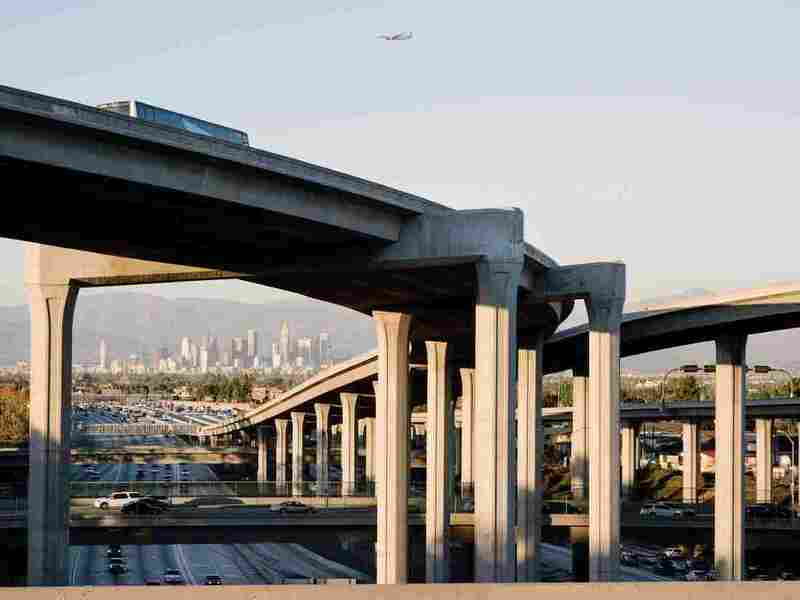 As industry grew, so did an infrastructure of freeways that connects the ports to the eastern reaches of Los Angeles and San Bernardino counties, where factories had the space to expand. In 2015, what's American made? The U.S. is known for manufacturing — it's part of our identity, though jobs have been lost. They've gone overseas. Technology has changed the way things are made. Nevertheless, America is still making stuff. And in terms of jobs, the Los Angeles area is the biggest manufacturing hub in the country. There are a few reasons why. There is plenty of space here to build things like factories and runways. That beautiful California weather? It's actually great for testing planes year-round. And then, of course, there are the people. The huge population base in Southern California is not only a good source of labor, but they also need to buy things, and they provide a built-in market for some manufacturers. But there are plenty of challenges, and the region has lost tens of thousands of jobs over the past several years. Flying over LA would give you a bird's-eye view of how the geography of the city has been shaped by — and has shaped — manufacturing. On the coast, there are the ports, where $1 billion in goods come in and out every day. The ports have helped make it easier to export the goods made here. Off the coast, ships wait in long lines along the coast to get in. There, shipping containers pile up on top of each other like Legos. Inland, in the shadow of downtown skyscrapers, there are miles of white-roofed factories, where workers make everything from clothing to furniture, from metal arts to food products. 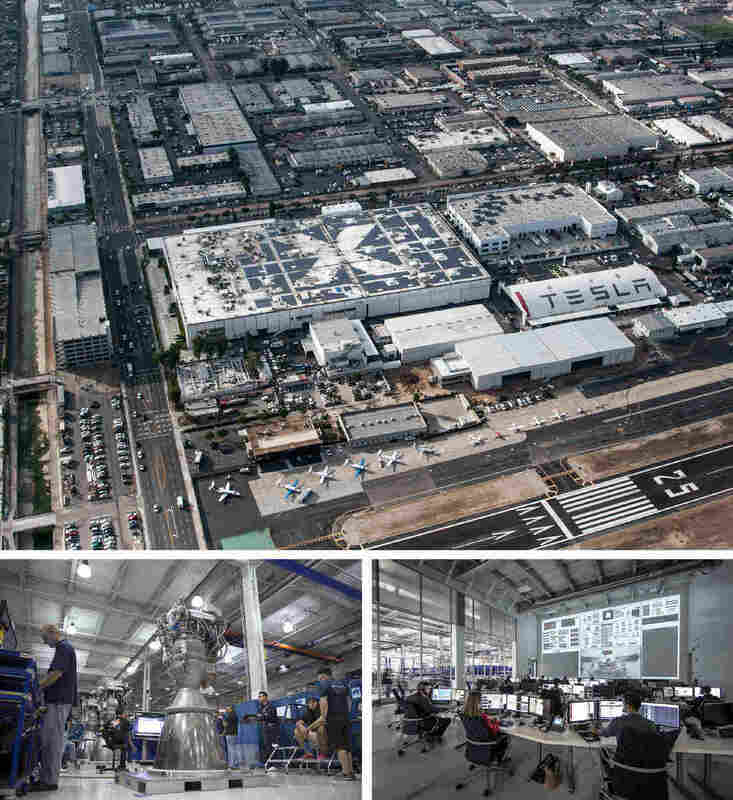 And then, as the city sprawls out, there's the new aerospace industry, which is a smaller, sleeker version of the one that thrived during World War II, the Cold War and the space race with the Soviet Union. Aerospace has had its heart in LA for decades, and SpaceX is a good symbol of the future of that industry. Its headquarters in the LA suburb of Hawthorne had at one time been used to make fuselages for Boeing airplanes. Now it houses a private company that's venturing into outer space. Technology — like drones and satellite communications — is also part of the new aerospace industry in the Los Angeles area. The area's ports have helped make it easier to export the goods made here. Ships wait in long lines along the coast to get in. There, shipping containers pile up on top of each other like Legos. The city may be known for Hollywood, but beyond the Hollywood sign and the Hollywood Hills are places like Burbank, where during World War II, big aerospace manufacturers like Lockheed came after getting defense contracts. Once orange groves, these towns offered companies space to make warplanes. Aerospace manufacturers also settled in other towns like Hawthorne and El Segundo, further stretching LA's sprawl and the need for swirls of highway, and, in the process, helping to create the geography of the city today. It's not like manufacturing is thriving as it had. There are many challenges in this economy. The aerospace industry has lost tens of thousands of jobs over the past 25 years. Costs are high in Southern California, and some companies are moving. Jeff Hynes, CEO of a company that makes jet engine parts called Composites Horizons, has lived through all this. "There is certainly no greater joy for a manufacturer [than] to walk through the factory and hear the noises and sounds of machines turning and people doing work," Hynes says. His father started the company in 1976. "We're in a transformational time. Just aerospace manufacturing in general, it's a good time. So, yeah, we aren't looking at a cliff," he says. The cliff for Hynes was 1997, when McDonnell Douglas, a huge airplane manufacturer in Los Angeles, left after merging with Boeing in Seattle. Hynes' company, located about 20 miles outside of downtown LA, instantly lost 40 percent of its work. "So we were kind of in a seminal moment in terms of determining where we were going to go with the business," he says. Professor Philip Yaghmai (left) talks to Ismael Becerra, 18, in the lab at El Camino Community College's Compton campus. Students translate machining theory into practice on vertical mills, CNC machines and other heavy equipment used in aerospace fastener manufacturing. The company shrank and then reinvented itself as a maker of niche jet engine parts. A lot of companies have had to take risks like that. Some American manufacturers have figured out that in this crazy global marketplace, one way to survive is to focus on something high-end or specialized and just do it well. But that's presented another challenge — finding the people who can do it. "It's not likely that we're going to find people that are trained in the skills that we need them to be trained in," Hynes says. Specialized manufacturers aren't finding the workers they need. The companies are doing training on their own. Schools are adapting, too, given that 80 percent of the world's aerospace fasteners — nuts, bolts, the things that hold one part of a plane to another — are made in Southern California. Philip Yaghmai, a professor at El Camino Community College's Compton campus, developed, with industry help, the only community college program in the country that trains machinists to make aerospace fasteners. Yaghmai, 62, who's originally from Iran, spent a majority of his career in the U.S. working as a mechanical engineer for various companies. He's been teaching in Compton for the past 6 1/2 years. "I felt like I could contribute more," he says. "My wife is African-American, and I like to contribute to the people that are maybe not as economically privileged." Compton is an economically depressed community. Only 7 percent of residents hold a bachelor's degree or higher. African-Americans were once the majority; now Latinos hold that status. Student Franz Dirzo's parents migrated from southern Mexico. Dirzo finishes his overnight job operating a forklift for Lowe's at 5 a.m., grabs a bite and a nap and takes classes from 8 a.m. to 3 p.m. two days a week. He's hoping he'll land a job in aerospace making more an hour. "I'm hearing things from like $18, $20 [an hour], so, very enticing," he says. He currently earns $13 an hour. He encouraged his cousin, Jose Lazaro, 24 — who's working at Home Depot — to join him. And even though they've had difficulty making it to class on time, and staying awake during the lectures, Lazaro says he and his cousin are determined to finish the program. "We're going to SpaceX; that's the goal right there," Lazaro says. "I see myself in SpaceX, I see him in SpaceX. That's where we're going."